Offense was tough to come by again in game two, wasting a solid effort from William Cuevas. The righty went six innings and allowed just two runs on four hits and was credited for a complete game. He walked two and struck out just one. Mike Miller singled in Rusney Castillo for the only PawSox run. Ryan LaMarre added a single and a stolen base. The Sea Dogs were supposed to play two, but after a rain delay of over four hours, they decided to just play one nine-innings game instead. The waiting around didn't help Portland's bats, as they were shutout and had just six singles. Aneury Tavarez went 1 for 3 with a walk, and Cody Decker walked twice. Cole Sturgeon singled and stole his eighth base of the season. Mitch Atkins lasted 5 2/3 innings and allowed three runs on four hits and two home runs. He struck out five and walked two. Ty Buttrey and Luis Ysla combined for 2 1/3 scoreless innings. Ysla struck out two in his inning of work. Late-game heroics were the story line in this one for Salem. Down by one in the bottom of the ninth, Jose Sermo led off the inning with a game-tying solo blast. Then, in the 11th with the score still tied, Deiner Lopez capped off his three-hit day with a walk-off single. Nick Longhi had two hits, including his 32nd double. Joseph Monge also added a pair of hits and Jordan Betts laced a double. Salem also swiped four bases, with one each from Lopez, Monge, Rafael Devers, and Mike Meyers, who now has 24 thefts. Matt Kent was great for eight innings, allowing just three runs (two earned) on seven hits. He did not walk a batter and struck out five. Yankory Pimentel came up huge in relief, with three shutout innings and three strikeouts. Jeremy Rivera led the Drive's 12-hit attack out of the number nine spot in the order. He went 3 for 4 with two RBI. Trent Kemp also had a big day, going 2 for 4 with a double, a triple, and two RBI. Kyri Washington hit his sixth triple, Austin Rei hit his 12th double, and Tate Matheny recorded two hits out of the leadoff spot. J.T. Watkins also reached three times with a single and two walks. Austin Glorius started and fired three scoreless frames, allowing just one hit. He struck out two and walked one. Trevor Kelley had a rough go of it out of the bullpen, allowing four runs on seven hits. Victor Diaz was tremendous, striking out six and not allowing a hit through 2 1/3 scoreless innings. Stephen Nogosek finished it off, allowing a run in two innings. The Spinners put it all together with great pitching and hitting for their final game before the all-star game. Bobby Dalbec continued to swing it by going 3 for 5 with a pair of doubles and two RBI. 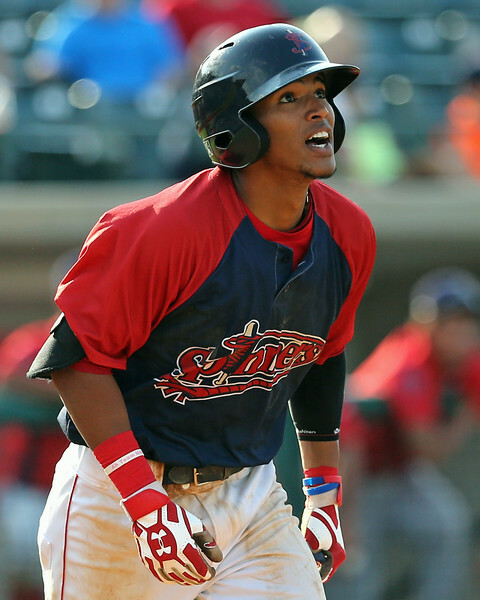 Victor Acosta also went 3 for 5 with a double. Yoan Aybar had two doubles and two RBI as well. Jhon Nunez and Steven Reveles each went 2 for 4, with Reveles also reaching via the walk. Dakota Smith threw well again, tossing 5 1/3 scoreless innings. He allowed just two hits and struck out seven with no walks in the process of lowering his ERA to 1.96. Pat Goetze threw 1 2/3 innings of hitless ball, and Matthew Gorst and Jordan Weems each threw a scoreless inning. Gorst struck out three. Player of the Night: Not only did Deiner Lopez have three hits, but he came through in the clutch with a walk-off single. It has been a struggle for Lopez in 2016, batting just .237 with a .637 OPS. However, he's been hot of late, batting .394 with six walks and just five strikeouts over his last ten ballgames.